Acting Chief Benjamin Nottaway is being held in jail for 45 days, not counting 2 weeks in pre-trial detention, for peacefully protesting on highway 117 in attempts to have Barriere Lake's signed agreements honoured and for the Canadian government to respect Barriere Lake's Customary Governance. This is part of a larger and disturbing trend in Canada, where indigenous leadership are being jailed for standing up for their constitutionally-recognized Aboriginal rights. 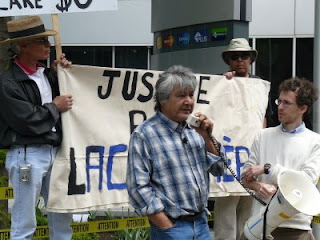 In Ontario, both KI6 and Bob Lovelace were jailed for peaceful protest for several months. A decision that was overturned in the court of appeal. governments of Canada and Quebec. It reads like a tale ripped from the headlines of a war-torn dictatorship. community of 450 people three hours north of Ottawa. comes to defending aboriginal land title and resource rights. case in the news media. He says he came to power in January after a three-month leadership review, which he launched because he was upset that Mr. Nottaway's group had closed the band school, a move he perceived as motivated by their own political aims. "It's no good for our kids to use them as political pawns," Mr. Ratt says. "A lot of people didn't agree with those tactics." "But I'm still in the community," he says. "It's a steady struggle." Barriere Lake does not elect leaders according to the one-member, one-vote system set out in the Indian Act, but instead uses a selection system led by a council of elders. The federal government says it has no role in adjudicating that system, but has acknowledged the election of Mr. Ratt's group and says it will conduct business with his council. of using violent tactics to disperse the protesters. In November, Mr.
appoint an independent observer to oversee a new leadership selection. days," Mr. Nottaway says. "I'm a political prisoner, and they know that. toward finding both short- and long-term solutions for his community. resource management honoured by the province and the federal government. "The government imposed a minority faction on our community," he says. I'm in here, we're not going to stop fighting." Kitiganik/Rapid Lake, Algonquin Territory / - On Thursday December 4th a Quebec judge sentenced Barriere Lake Acting Chief Benjamin Nottaway to forty-five days in jail, in addition to fifteen already served in pre-trial detention, for participating in peaceful blockades intended to draw attention to violations of Barriere Lake's rights by the Canadian and Quebec governments. Barriere Lake has been demanding that Canada and Quebec honour signed agreements and that Canada appoint an observer to witness and respect the outcome of a new leadership selection in accordance with Barriere Lake's Customary Governance Code. "It's shameful that the government of Quebec would rather throw me in jail than fulfill their legal obligations by implementing signed agreements," said Acting Chief Nottaway, a father of six who passed his twenty-eighth birthday in jail last Thursday. "Meanwhile, the Government of Canada continues to interfere in our internal affairs while trying to wash its hands of responsibility for this situation." Nottaway was charged with three counts of mischief and breach of conditions stemming from March blockades on Barriere Lake's access road and a November blockade on highway 117 outside the community's reserve in Northern Quebec. Another blockade in October was violently dismantled by Quebec riot police, who used tear-gas on a crowd that included Elders, youth, and children. More than 40 members of the community of 450 have been charged for these actions. "Quebec has now joined the company of Ontario, which put the leaders of Kitchenuhmaykoosib Inninuwug (KI) First Nation and Ardoch Algonquin First Nation behind bars for peaceful protest. It seems like the provinces' preferred method for dealing with our rights is to use the police and the courts to punish us until we forget about them," said Marylynn Poucachiche, a community spokesperson who was arrested during the November blockade. Crown Attorney France Deschamps asked Judge Jules Barriere for a sentence of 12 months, saying a "clear message" was required "to make sure Nottaway has no desire to do this again, and to discourage the group – because his supporters are waiting to hear what happens here." Judge Barriere noted that the Crown's request was "partly illegal," as 6 months is the maximum possible sentence for summary convictions. But he agreed with Deschamps that a prison sentence was necessary, saying it was "important to pass a clear message to the community." "The only message the Canadian and Quebec governments are sending is that they are willing to criminalize our community and split apart our families in order to avoid implementing precedent-setting agreements and respecting our leadership customs," added Nottaway. Barriere Lake wants Canada and Quebec to uphold signed agreements, dating back to the 1991 Trilateral Agreement, a landmark sustainable development and resource co-management agreement praised by the United Nations and the Royal Commission on Aboriginal Peoples. Canada has been in breach of the agreement since 2001. Quebec signed a complementary Bilateral agreement in 1998, but has stalled despite the 2006 recommendations of two former Quebec Cabinet Ministers, Quebec special representative John Ciaccia and Barriere Lake special representative Clifford Lincoln, that the agreement be implemented. 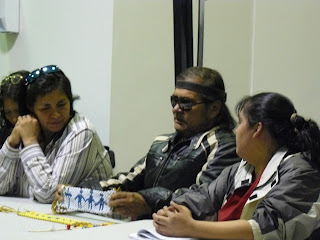 On March 10th, 2008, the Canadian government rescinded recognition of Acting Chief Benjamin Nottaway and his Council and recognized individuals from a minority faction whom the Barriere Lake Elder's Council says were not selected in accordance with their Customary Governance Code. On March 2nd and 3rd, community members had set up blockades on their access road to prevent members of this minority faction from entering the reservation, anticipating the Canadian government would try to illegally interfere in Barriere Lake's internal customary governance for the third time in 12 years. Marylynn Poucachiche takes on Assistant Regional Director of Indian Affairs, Pierre Nepton, on Radio Canada International's The Link (Dec 8 2008). The interview starts half way through the file and lasts for 10 minutes. Green Party of Canada is calling for an investigation into the infringement of the rights of the Mitchikanibikok Inik, also known as the Algonquin of Barriere Lake, particularly their right to peaceful assembly. Kitiganik/Rapid Lake, Algonquin Territory / - SQ officers and a Riot Squad arrested five Barriere Lake Algonquins, including a targeted arrest of Acting Chief Benjamin Nottaway, after forcing community members off highway 117, during their fourth in a series of blockades over a period of seven hours. "Chief Nottaway sent a letter to Premier Charest on Monday requesting that the government resolve political issues through negotiations rather than police violence," said community spokesperson Norman Matchewan. "Blockades are a tactic of last resort. For two decades now all we've asked is that Quebec and Canada honour signed agreements but they prefer to play with our lives." As the community was pushed off the highway for the last time at 2:30 pm, riot police broke out of formation to chase and arrest Acting Chief Nottaway. His was the second targeted arrest of the day. 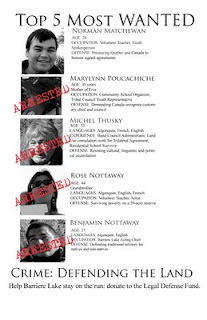 Community youth spokesperson Marylynn Poucachiche, mother of five and organizer of the community school, was arrested at one of the morning blockades after being reassured by police that no arrests would be made since protesters had agreed to leave peacefully. One community member was pushed to the ground and kicked by several SQ officers before being arrested. "The police dragged him with his head on the ground all the way to the police car," said one community member. Another woman from the community fell while being pushed back onto the access road leading to the Barriere Lake reserve, and hit her head. She was subsequently arrested. Kitiganik/Rapid Lake, Algonquin Territory / - The Barriere Lake Algonquins have blocked highway 117 by gathering in the middle of the road, after Quebec police dismantled their log blockades earlier in the day, and have now been put on notice that the Riot Police will arrive momentarily. 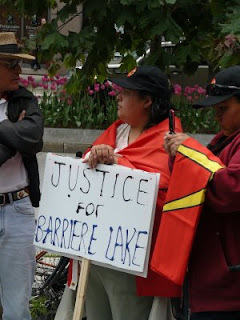 DEMONSTRATION IN SOLIDARITY WITH BARRIERE LAKE A CALL FOR SOLIDARITY AND SUPPORT! 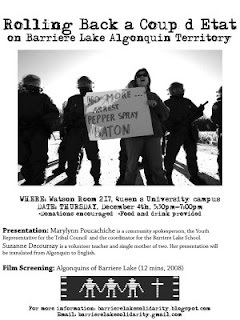 Join Barriere Lake Solidarity in a demonstration to call on Premier Charest to STOP using riot police, tear gas and pain compliance and START honouring signed agreements with Barriere Lake Algonquins. 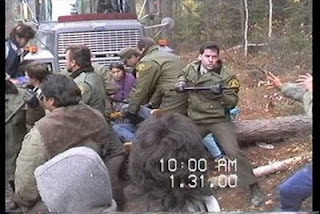 In early October, as a method of last resort, families from the Algonquin community of Barriere Lake blockaded highway 117 in northern Quebec, demanding that the Federal and Quebec governments uphold the agreements they signed with the community, and stop imposing illegitimate leadership on the community in order to avoid their responsibilities. Norman Matchewan, community youth spokesperson says, "Both the federal and provincial governments have treated us with contempt, refusing to respect the agreements they've signed with us. We've exhausted all our political options, but they've ignored or dismissed our community, leaving us with no choice but to peacefully blockade the highway to force the government to deal fairly with us." Instead of sending in negotiators, honouring signed agreements and sending an observer for their leadership re-selection, dozens of riot cops overran the families who were peacefully demonstrating. Riot cops surrounded the area, and launched tear gas canisters, one of which hit a disabled community member in the chest. 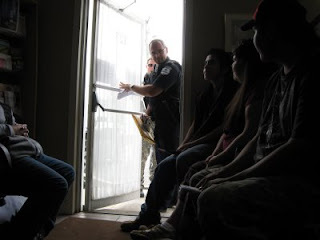 Nine people, including an elder, a pregnant woman, and two minors, were arrested. Eight demonstrators remained locked down to concrete-filled barrels, but police used "pain compliance"--roughly, torture--to force them to let go, and be arrested. There have been many outcries against the actions taken by Charest's government. Angus Toulouse, Ontario Regional Chief, in a letter to Charest on October 10th wrote, "the leadership of the First Nations of Ontario are very concerned regarding the approach taken by the SQ against the ABL…Resorting to aggressive police action is clearly regrettable and further does not address the root causes of this situation." Several European human rights organizations recently supported Barriere Lake's demands and condemned police actions taken against the community. WINNIPEG— Spokespeople from Indigenous communities involved in land struggles across Canada will issue a national challenge to Prime Minister Stephen Harper and the Conservative government's policies when Harper attends the Conservative Convention in Winnipeg this week, delivering a letter to Harper on Thursday at 6pm, and following up with a press conference on Friday at the Winnipeg Convention Centre. Indigenous organizers, leaders and membership will be meeting in Winnipeg for the Defenders of the Land Gathering from November 12-14th, 2008 to share strategies and solutions for achieving land rights and self-determination. The Defenders of the Land Gathering will feature special presentations by members from the Algonquins of Barriere Lake, Six Nations, Athabasca Chipewyan First Nation, Ardoch Algonquin First Nation, Kitchenuhmaykoosib Inninuwug, Secwepemc First Nation, while many others will be in attendance. The Defenders of the Land Gathering will focus on several key principles including recognition and respect for Inherent, Aboriginal and Treaty rights; opposition to arbitrary, one-sided federal and provincial legislation, policies and practices that negatively affect Indigenous Peoples; stopping the environmental degradation of Indigenous lands; a fair and just interpretation of section 35 of Canada's constitution, including the elimination of the racist, outdated concepts of the Doctrine of Discovery and Terra Nullius; and the application of the Articles of the United Nations Declaration on the Rights of Indigenous Peoples in Canada. Nottaway's imprisonment for two months is only the latest chapter in the long and difficult struggle of Barriere Lake, a small Algonquin community three hours north of Ottawa in Northern Quebec. Seeing their forests devastated by clear-cut logging, they compelled Canada and Quebec to sign an internationally praised sustainable development agreement in 1991. The agreement was intended to give them joint management of 10,000 square kilometres of their traditional territory and benefits from the resource extraction on their land – $100 million is taken annually in logging, hydro-electricity, recreational hunting and tourism, and they have never received a cent. But the Canadian government pulled out of the binding agreement in 2001, and Quebec has stalled on its implementation since 2006, despite recommendations issued by provincial and community negotiators. To avoid their obligations under these agreements, the federal Department of Indian Affairs has repeatedly interfered in the internal governance of the community, which selects their leaders according to a customary method. In March, the Canadian government ousted Chief Nottaway and his Council and recognized a faction not supported by the community's majority and whom the Elder's Council says were not legitimately selected. Since then, Barriere Lake has mounted a campaign to have the Quebec and Canadians governments honour their agreements and for the federal government to resolve the leadership crisis by appointing an observer to witness and respect the outcome of a legitimate leadership re-selection. The only message the government of Canada is sending is that they are willing to play with the lives of Indigenous people to avoid implementing precedent-setting agreements. Join Barriere Lake community members in Ottawa while they demand that the Canadian government live up to its promises, respect the Algonquin's customary government, and stop collaborating with Quebec in the criminalization of an entire community and its leadership. Respect signed agreements! Release all First Nations political prisoners! Montreal/- The Green Party of Canada is calling for an investigation into the infringement of the rights of the Mitchikanibikok Inik, also known as the Algonquin of Barriere Lake, particularly their right to peaceful assembly. There have been reports this week of tear gas and police violence during a protest at this First Nation, involving a crowd which included Elders and children. The protest was to draw attention to the failure of government to honour the 1991 Tri-lateral Agreement and the 1998 Bi-lateral agreement signed with Canada and Quebec. The recommendations of these agreements are meant to protect Algonquin land uses, including conservation of forest and wildlife, and also improve these peoples dire economic situation. "It is not enough to apologize to Canada's First Nation's, they need help in a real way to address the continually deteriorating conditions on reserves and support to realize true self-government," said Green Party Leader Elizabeth May. 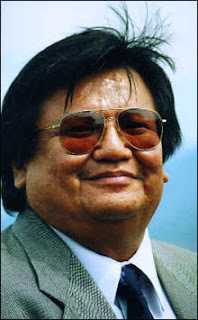 In 1989, Ms. May worked to help set up the office for the Trilateral Commission on behalf of this First Nation along with former MP and former Quebec Environment Minister the Honourable Clifford Lincoln. "The Algonquin of Barriere Lake have shown extraordinary patience in the face of governmental interference and foot-dragging," said Ms. May. I'm perched on an embankment overlooking Highway 117, an obscure but economically important link between Montreal and northern Quebec. To look at most maps, there's nothing here, five hours north of Montreal, well out of the cottage towns and ski resorts of the Laurentians and still two hours short of the cluster of resource extraction economies around Val d'Or. I'm in the middle of a four hour stretch where most travellers could be forgiven for thinking was nothing but a few hunting lodges, logging roads and Hydro Quebec turnouts. A girl, young enough that I have to bend down to hear what she's saying, climbs up the embankment and points at the highway. "Look where we're colouring," she says. An Ontario chiefs organization has sent letters to Prime Minister Stephen Harper and Quebec Premier Jean Charest condemning the actions of the Surete du Quebec for using force to clear an Algonquin blockade Monday in northern Quebec. The letters, dated Oct. 10, calls on Ottawa and Quebec City to follow the advice of the Ipperwash Inquiry, which probed the events of a First Nations occupation in Ontario that led to the shooting death of Dudley George, a native protester shot dead by an OPP officer. "The leadership of the First Nations of Ontario are very concerned regarding the approach taken by the Surete du Quebec against the Algonquins of Barriere Lake," said the letter, signed by Angus Toulouse, Ontario regional chief with the Chiefs of Ontario. "Resorting to aggressive police action is clearly regrettable and further does not address the root causes of this situation." Toulouse said Ottawa and Quebec City should open talks with the poverty-stricken community of about 650, which is currently embroiled in a leadership dispute. The Algonquin Nation Secretariat, an umbrella group that represents the Algonquins of Barriere Lake, also criticized police action in a letter to Charest dated Oct. 8. The Algonquins said a three-year-old girl was hit by a tear-gas canister fired by police during the blockade. They also accused the police of attacking elderly demonstrators. The SQ said police fired canisters containing a chemical irritant, not tear gas, at the crowd and that paramedics said that no one was injured. Nine people were arrested and charged with mischief. The blockade, set up about 300 kilometres north of Ottawa, was organized by a portion of the community in an attempt to pressure the Department of Indian Affairs into backing a new leadership selection process. The group, led by former acting chief Benjamin Nottaway, says current Chief Casey Ratt took power through a flawed process. The community follows a traditional leadership code. Nottaway's supporters also want Indian Affairs to honour a signed deal giving the community a say over the development of 10,000 square kilometres of their claimed territory. 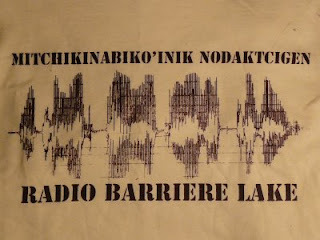 The Barriere Lake Algonquin community, with support from the Barriere Lake Solidarity Collective, is in the process of starting up a 15 watt FM radio station: Mitchikinabiko’inik Nodaktcigen (Radio Barriere Lake) on the Rapid Lake Reserve. The primary aim of the project is to serve the Barriere Lake community, with the intention of strengthening autonomy, culture and traditions. Broadcasts will be educational, cultural and primarily in the Algonquin language, which is still widely spoken in the community. Broadcasters will combine the oral tradition with radio and computer technologies to engage both elders and youth, while connecting with other Native communities from coast-to-coast. The community and the Barriere Lake Solidarity collective are working to raise the $3,000 needed to get the project off the ground. We are looking for donations, radios and radio station equipment. If you can give any of the aforementioned items, please email barrierelakesolidarity@gmail.com or call 514.893.8283 -- we'd love to hear from you. Come out to our radio fundraisers. The Barrière Lake Algonquins' decision to peacefully blockade Highway 117 was not easily made. We have always preferred co-operation to confrontation. We do not wish to disrupt the lives of Canadians. Unfortunately, it seems their governments otherwise ignore or dismiss us - or worse, treat us with contempt. During a protest at federal Transport Minister Lawrence Cannon's campaign launch last month, his assistant insinuated that I was drinking. After the media scandal forced Cannon to hold a meeting we had been requesting for two years, he vilified our community's majority as "dissidents" in an op-ed in regional papers. The government has now tried to add "criminals" to the charge. To avoid negotiations, the government allowed Monday's peaceful blockade to be dismantled by the Sûreté du Québec, which without provocation shot tear gas canisters into a crowd of youth and elders and used severe "pain compliance" to remove people clipped into lockbox barrels. In 1991, Barrière Lake signed a historic trilateral agreement with Canada and Quebec to sustainably develop our traditional territories - a United Nations report called the plan an environmental "trailblazer." Yet in 1996, the federal government tried to hijack the agreement by replacing our legitimate chief and council with a minority faction who let the agreement fall aside. We have always ruled ourselves according to custom, outside the electoral provisions of the Indian Act: Elders nominate eligible leaders who are then approved, by consensus if possible, in assemblies. Participation is open only to those who live in the community, speak our language, and have knowledge of and connection to the land. But in 1996, the Department of Indian Affairs encouraged this faction, located mainly off-reserve, to collect signatures for a petition; Indian Affairs then imposed this group on us, claiming our leadership customs had evolved into "selection by petition." The was not the truth. In The Gazette, former provincial Liberal cabinet minister Michel Gratton issued a devastating rebuke: "This unilateral and sudden decision to dismiss and replace the existing chief and council goes against the grain of every democratic principle." We suffered grievously for a year and a half. Although we barred the minority group from our community, they colluded with the government from Maniwaki. On the reserve, we were deprived of federal transfers for employment, education, social assistance, and electricity. We lived in the dark, educated our children as we could, and barely subsisted off bush food. A resolution was finally achieved in 1997 by Quebec Superior Court Judge Réjean Paul and two federal facilitators, who restored our legitimate chief and council and renewed the trilateral agreement. To prevent future interference, they helped codify our leadership customs into a Customary Governance Code that the government promised to respect. This is our aboriginal right protected by the Canadian Constitution - the highest law in the land. Even this proved little deterrent to further meddling. In 2001, the federal government pulled out of the trilateral agreement and started favouring certain community members opposed to our legitimate leadership. Paul mediated again in 2007, concluding that the opposition to our chief and council was "a small minority" whose leadership challenge "did not respect the Customary Governance Code." But when this same minority group conducted another supposed leadership selection in January 2008, the federal government quickly recognized them. In court, we forced the government to release an observer's report they relied on: not surprisingly, the report stated there was no "guarantee" that the Customary Governance Code was respected during this selection. Yet again, the government is throwing democratic principles to the wind by ignoring our customs and the wishes of our people. 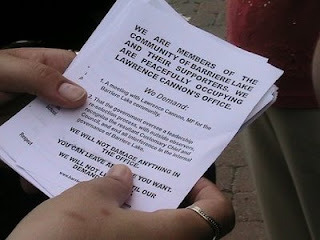 And Cannon has the audacity to call the overwhelming majority of our community members "dissidents"! To resolve the crisis, we are prepared to participate in a new leadership selection according to our Customary Governance Code. We ask only that the federal government appoint an observer and promise to recognize the result, and that they and the province honour our agreements. We set up the blockades Monday morning as a last resort, to inspire in the government a changed attitude. Our good faith and patience and reasonable demands have so far been rewarded by broken promises, deceit, and deplorable interventions. Is this all we can expect? 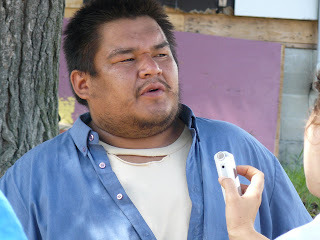 Norman Matchewan is youth spokesperson for the Algonquins in Barrière Lake, which is 130 kilometres north of Maniwaki. "Our demands are reasonable," said Norman Matchewan, a spokesperson who was racially slurred by Minister Lawrence Cannon's assistant earlier in the election. "We're only asking for the government to uphold the agreements they've signed and to stop illegally interfering in our customary governance. The message we've received today is that Stephen Harper and Jean Charest are unwilling to even play by their rules." "We will not tolerate these brutal violations of our rights," added Matchewan. "Forestry operations will not be allowed on our Trilateral agreement territory, and we will be doing more non-violent direct action." Nine people, including an elderly women, a pregnant woman, and two minors, were roughly arrested. While a line of police obscured the view of human rights observers from Christian Peacemaker Teams, officers used severe "pain compliance" techniques on protestors who had secured themselves to concrete-filled barrels, twisting arms, dislocating jaws, leaving them with bruised faces and trouble swallowing. "In this election alone, the Conservatives have labelled us alcoholics and vilified our community's majority as "dissidents," said Michel Thusky, another community spokesperson, referring to an op-ed published by Minister Lawrence Cannon in regional newspapers. "Now they and Quebec have chosen violence over meeting their most basic obligations to our community. 'Pain compliance' is the perfect description of the Conservative government's aboriginal policies." 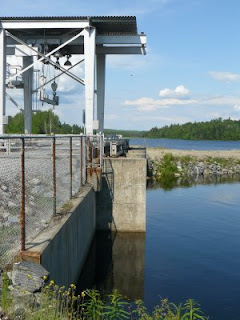 Barriere Lake community members had promised to maintain the blockade until the Government of Canada honoured the 1991 Trilateral agreement, a landmark sustainable development and resource co-management agreement praised by the United Nations and the Royal Commission on Aboriginal Peoples. To end federal interference in their leadership customs, they wanted the Government of Canada to appoint observers to witness a leadership reselection according to their codified customary selection code, respect its outcome, and then cease interfering in their internal governance. 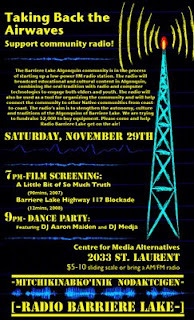 The Algonquins of Barriere Lake live just under 5 hours from Montreal, traveling north west. Once you leave the city limits you follow a two lane highway, the 115, that eventually narrows to one, past vacation spots like Mount Tremblant and a number of road-side stands selling poutines and cheeseburgers. The distance between towns widens, and logging roads start trailing off the highway. Large trucks, perhaps belonging to the American multinational Domtar, stacked high with freshly shaved trees, drive towards one of the local paper mills. In the heart of one of their prime cutting zones sits the Barriere Lake reserve; created in 1961 without consultation with the small Algonquin community's customary chief and council. The nomadic community, only a few hundred people strong, was squeezed onto 59 acres in 1961, despite having a traditional territory roughly 17,000 square kilometers large. Some houses on the reservation hold up to 18 people. The land-base is too small to accommodate new houses, and the diesel generators that currently power the community have hit maximum capacity. 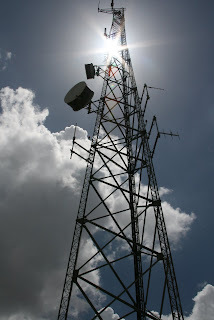 The community is still waiting to be hooked up to the grid-another unfulfilled promised. Ironic-considering the millions of revenue dollars extracted from the area from the numerous hydroelectric dams. Hydroelectricity is not the only resource extracted from the traditional territory. When logging and tourism are added to the equation, it is estimated annual revenues add up to roughly $100 million. The Algonquins of Barriere Lake do not see a cent of it. Over time a number of private companies and Crown corporations have increased the extraction of resources from the territory. Over twenty years ago the unrestrained clear cut logging practices and sport hunting became too much for the community to quietly bear witness to. Protests, and later the blockading of logging roads, finally led to negotiations with the Canadian and Quebec governments. The outcome of those negotiations was the Trilateral Agreement; an agreement based on the United Nations Brundtland Commission, with conservation and sustainable development as the main pillars. The landmark agreement promised co-management of resources and revenue sharing in the traditional territory in order to protect the Algonquin way of life while co-existing with non-native land users. The government had other plans. Just before the Trilateral's implementation in 2001 Indian Affairs Minister Robert Nault pulled out, leaving the community with a large bill to pay for remaining research on traditional land use. Cutting funds hasn't been the only method employed by the federal government in attempts to scrap the trilateral agreement. Since 1996, there have been three interventions in the community's leadership selection. Indian Affairs imposed Third Party Management on the community, the third and most severe level of financial intervention in an Aboriginal community. Third Party Managers gain complete control of community finances. During the 15 month period that Indian Affairs refused to recognize the Customary Chief and Council, both the minority faction Council and Third Party Management were unable to establish themselves on the Rapid Lake reserve, and instead ruled from exile in Maniwaki (150km south). Two million dollars in funding never reached Rapid Lake, programs and services were suspended, and the only school was closed. For a second time Indian Affairs appointed Third Party Management. 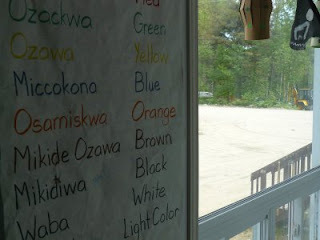 Once again, the school was shut down after parents discovered the teachers hired by Third Party Management refused to allow children to speak their Algonquin language -- a grim throw back to residential schools. ”[Cannon’s] inaction confirms that his Conservative Government's residential school apology was meaningless, because they continue violating our customs." - Michel Thusky, community spokesperson. This past March, Indian Affairs Minister, Chuck Strahl, ousted Acting Chief Benjamin Nottaway and empowered a minority faction as the new leadership. This brings the count up to three: three times now Indian Affairs has meddled in the internal governance of Barriere Lake. The Algonquin Nation Secretariat and the Union of British Columbia Indian Chiefs called the move a coup d'etat. The Tribal Council representing three Algonquin communities including Barriere Lake, continues to recognize and work with deposed Acting Chief Nottaway and his Council. Thursday, June 26th Algonquins of Barriere Lake and some of their supporters from the Montreal-based Barriere Lake Solidarity Collective, peacefully occupied Lawrence Cannon's office. Lawrence Cannon, is a cabinet minister, Harper's Quebec lieutenant and MP in Barriere Lake's riding of Pontiac. Protesters were calling on Cannon to use his power to ensure Indian Affairs upholds the law and oversees a leadership re-selection. “It has been about 20 years now [since the signing of the Trilateral Agreement] -- I was eight years old when we first signed the agreement. I’m 26 years old now. I’ve been waiting; we’ve been waiting a pretty long time now for the government to honour its agreement to the Barriere Lake people.” – Jessica Thusky, one of the Algonquins of Barriere Lake arrested in the action. Two Algonquins, one of which was a minor, and four supporters spent the evening in jail and now face three charges: obstruction of a police officer, trespassing, mischief. "We told them we would stop disobeying the law if Cannon did so as well. It's a small act of civil disobedience to draw attention to a far greater crime." – Martin Lukacs, member of Barriere Lake Solidarity Collective. "The community will pursue Cannon wherever he is publicly, and we will only stop when Cannon honours his word, and ensures his Conservative government oversees a leadership re-selection, then stops meddling in our affairs for good." – Michel Thusky. 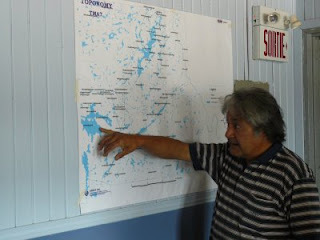 As the community works to get Indian Affairs and the Canadian government to uphold the law and recognize the Algonquins of Barriere Lake's customary governance code, more and more of the land continues to be irreparably damaged by logging and hydroelectric companies, and unemployment rates that run around 80-90 per cent persist.